the secret to an effective fly treadmill is getting the air pressure right. 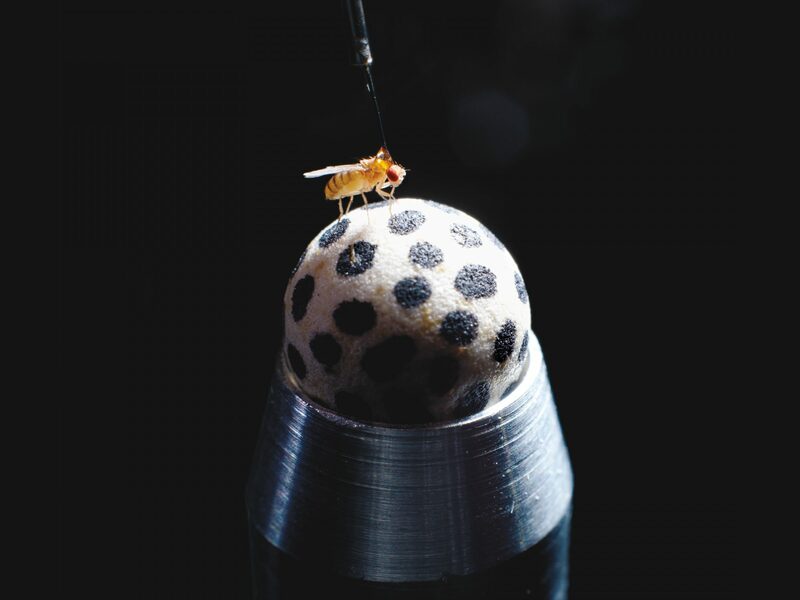 You need just enough to keep the fly’s walking surface—a smooth ball about the size of a pea—spinning freely, but not so much that it starts to gyrate. Gaby Maimon’s Laboratory of Integrative Brain Function didn’t invent the fly treadmill. But their work, alongside others’ in the field, has taken it to the next level, enclosing it in a visual virtual-reality environment and training cameras on the ball that allow them to observe Drosophila melanogaster’s navigational decisions while simultaneously recording neural activity in neurons. Members of the Maimon lab carve the ball out of foam using a homemade tool akin to a melon baller, then ink the markings with a Sharpie and balance it atop a custom-machined air jet nozzle that lets it rotate freely. Tracking software, adapted from code written by colleagues in Australia, is fed by cameras trained on the ball’s markings. The treadmill setup allows Maimon and his colleagues to ask sophisticated questions about how the brains of their tiny subjects calculate angles, keep track of where they’ve been, and avert danger. just how dark does it have to get before our eyes stop working? Entirely dark, according to recent experiments. They suggest the human eye can detect the presence of a single photon, the smallest measurable unit of light, once it has been acclimated to the dark. A 60-watt incandescent lightbulb emits roughly 8.2 quintillion photons per second. Earlier studies had established that the human eye meets its limit at flashes of five to seven photons, but these experiments may have lacked the technology needed to produce such tiny, precise bursts of light. 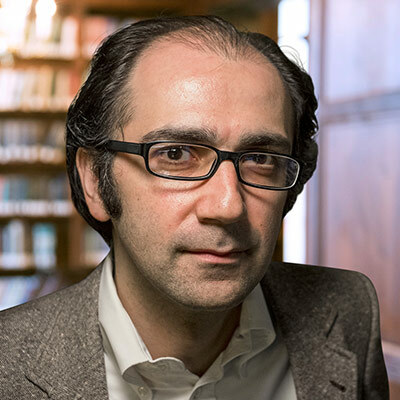 “It is not trivial to design states of light that contain exactly one or any other number of photons,” Vaziri says. His team was able to achieve this by implementing a combination of a psychophysics procedure and a quantum light source that can generate single-photon light states. The results, which combined data from more than 30,000 trials, were published in Nature Communications. Constructing laboratories is easy, at least compared with constructing them over one of Manhattan’s busiest roads. That takes a 1,000-ton marine crane, special permits from the Department of Transportation, and a close eye on the tides. 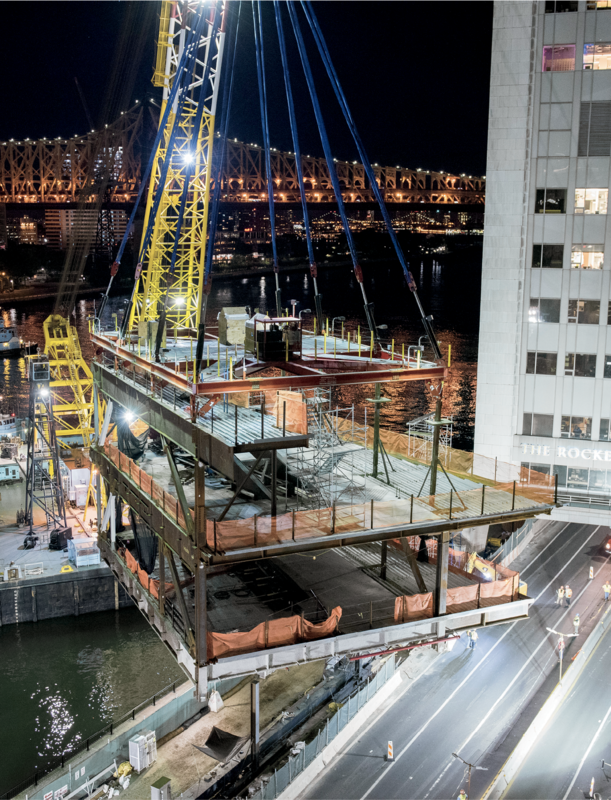 Early last summer, the first of 19 pre-assembled steel modules making up Rockefeller’s new $500 million Stavros Niarchos Foundation–David Rockefeller River Campus arrived via barge and was hoisted into place in a single overnight operation, precisely choreographed by a small fleet of tugboats. magnify a cell a few ten thousand times, and a pilled-sweater pattern starts to emerge. Some of the cell’s internal structures are covered with tiny, dense bumps called ribosomes, molecular machines made of RNA and protein whose job is to manufacture other proteins. To keep growing, a cell has to produce thousands of new ribosomes every minute. If it fails to do so, it won’t be able to divide. So if you want to get rid of certain cells, their ribosome assembly line might make a useful target. In studying how yeast cells piece their ribosomes together, a team led by Tarun Kapoor has discovered a compound they believe might be developed into an effective antifungal medication. The researchers report in Cell that the drug, called Rbin-1, throws a wrench into the ribosome assembly process, halting the proliferation of yeast cells. 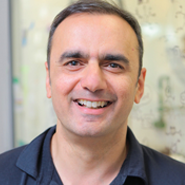 “Not only does this compound efficiently inhibit the growth of yeast cells, it does so through a unique mechanism,” says Kapoor, who is Pels Family Professor. That’s welcome news, since the repertoire of antifungal treatments is presently slim. And yeast infections—even generally benign ones like thrush—can be devastating if they spread throughout the body, especially in people with weakened immune systems. 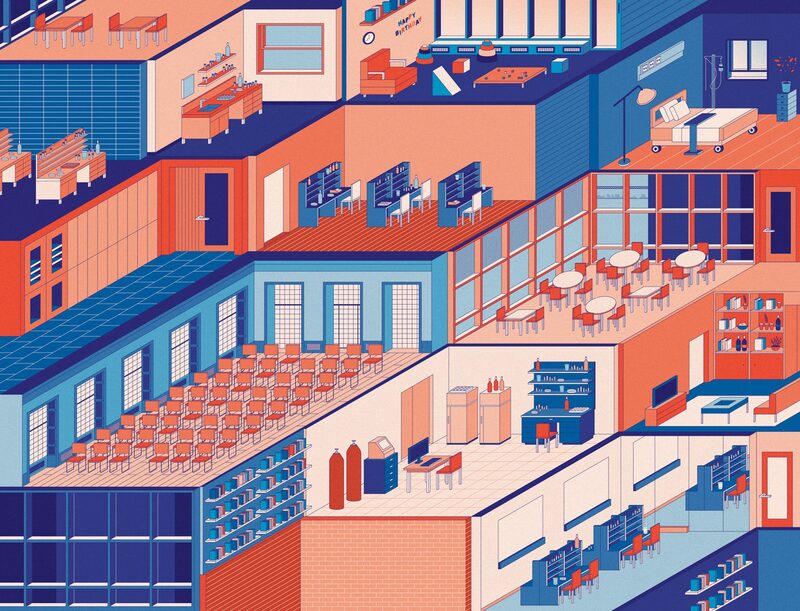 A growing cell can generate 2,000 or more ribosomes every minute, each assembled by a workforce of some 200 proteins. In young mice, wounds heal quickly. 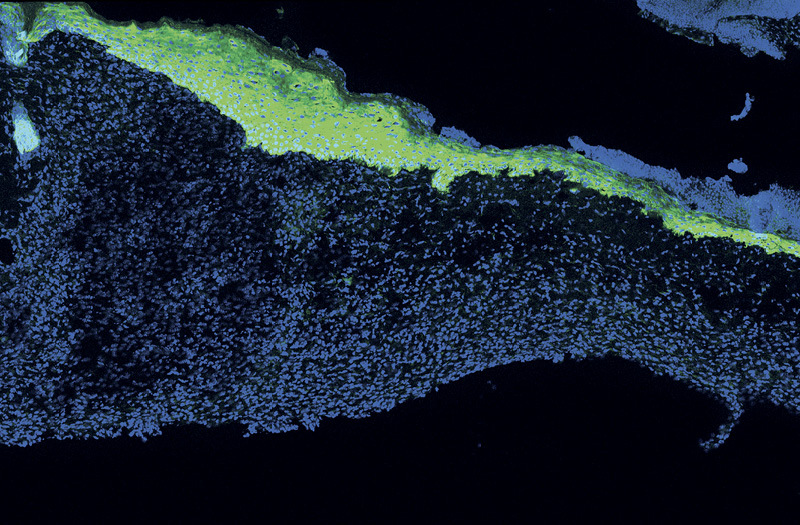 New skin cells, shown in green, have arrived to seal a wound within five days of the injury. the older we get, the slower our bodies mend. Scientists have been intrigued by this aspect of aging at least since World War I, when French surgeons serving at the front line documented that similar-size wounds healed a lot faster in 20-year-old soldiers than in 40-year-olds. Still today, biologists are trying to pinpoint exactly what changes in the body to slow down the wound-healing process. One explanation is that skin cells called keratinocytes lose their ability to communicate with nearby immune cells. Whenever the skin is breached, the body’s first response is to form a scab, and keratinocytes then travel in under the scab to seal the wound from below. Rockefeller researchers examined this process in 2- and 24-month-old mice—roughly equivalent to 20- and 70-year-old humans—and found that keratinocytes in the older mice took longer to arrive in the scab-coated cut. They also observed that these keratinocytes failed to recruit specialized immune cells, which in younger animals gather around the wound and help. It turns out that the signals the younger skin cells use to call upon immune cells can be manipulated to boost wound healing in older animals. In experiments done using skin tissue grown in a petri dish, the researchers were able to make aging keratinocytes behave more youthfully by rekindling specific signaling pathways within them. 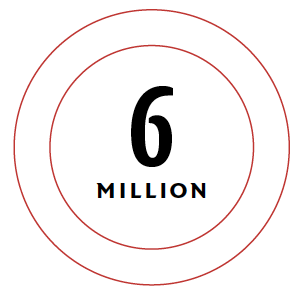 Number of Americans who suffer from chronic wounds, often as a complication of diabetes or other disease. 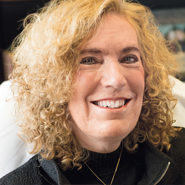 Elaine Fuchs, Rebecca C. Lancefield Professor, led the study, which was published in the November 2016 issue of Cell. She says the findings could lead to treatments that stimulate wound healing in elderly people. for ants, status is everything. 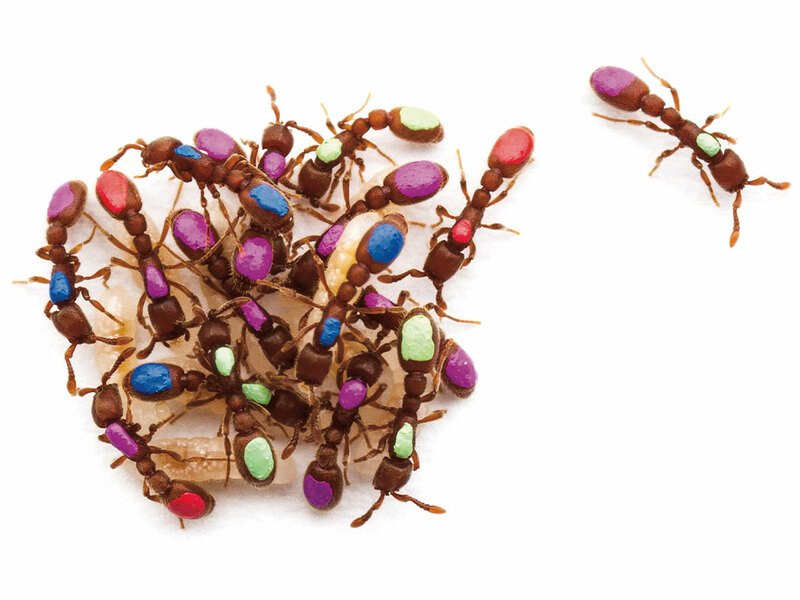 In any one colony there are queens, workers, and drones—each with unique anatomy and behavior. They look different, act different, and have dramatically different life spans. Yet their genes are identical. Daniel Kronauer, who keeps dozens of ant colonies in his Rockefeller lab, spends much of his time trying to understand precisely what accounts for this dramatic variation. And although others in the field thought they had a pretty good idea—they implicated a chemical process known as methylation for turning on and off individual genes—Kronauer decided to take another look. His lab’s examination failed to confirm previous results, finding no differences in the amount of methylation between individual ants. The earlier studies, by looking only at averages in methylation levels between different insect types, missed the fact that there was also considerable variation between insects of the same type, Kronauer says. to watch neural processes play out inside the brain, scientists typically have to compromise. They can either zoom in on a thin slice of tissue, producing detailed movies of the neurons firing within it—or view a big chunk of it as a murkier blur. 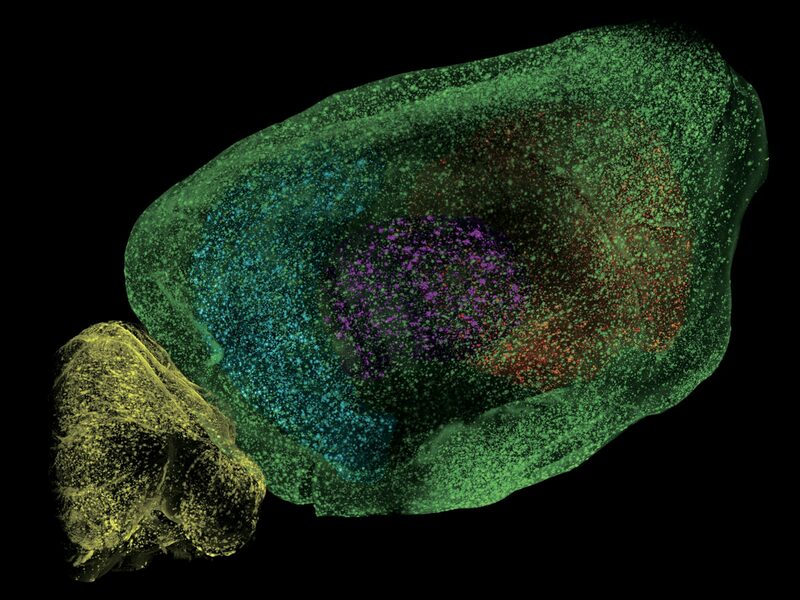 Lavigne’s Laboratory of Brain Development and Repair, he is mastering a new imaging technique that allows him to capture—in one crisp snapshot—all the neural activity within an entire mouse brain. He and his colleagues have applied it to study, among other things, the neural pathways that activate when mice are parenting their pups. 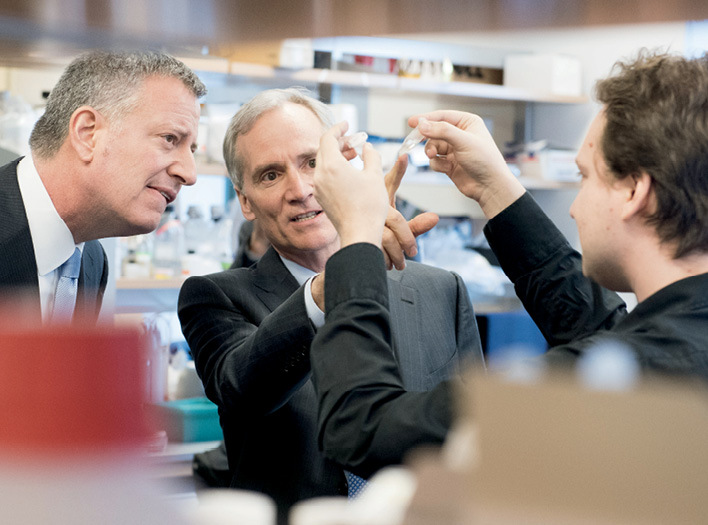 And last year, Renier got the chance to show off the protocol to New York City Mayor Bill de Blasio, on campus for a biotech conference. A critical step in the procedure is to make the tissue transparent by “clearing,” a chemical soak that takes one to two weeks. The result, as the mayor got to witness, is a see-through brain. 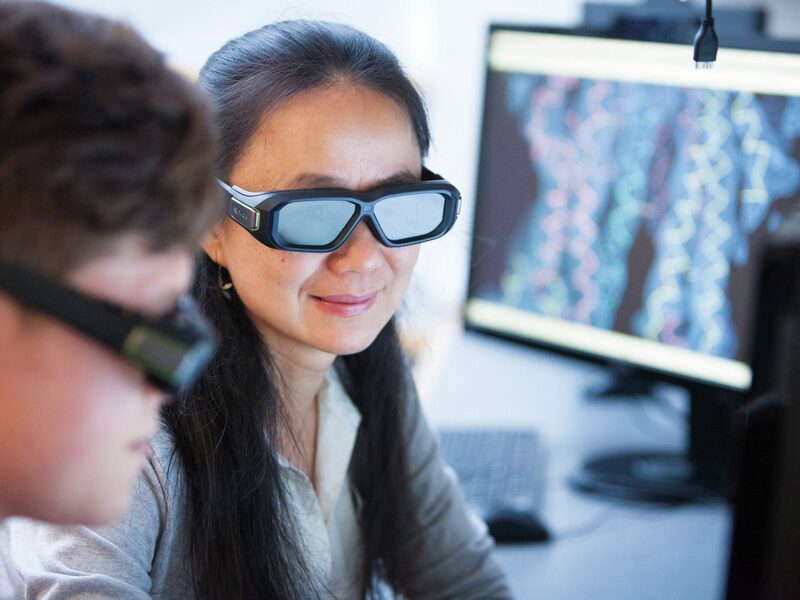 Its inner regions can now be exposed by light-sheet microscopy, in which active neurons are captured in three dimensions, snapshot by snapshot (view a single snapshot in “Inside Alzheimer’s”). The method can be used to explore how the brain changes in disease, how it responds to a drug, or how it performs sophisticated computations like those involved in decision-making. 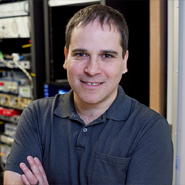 “You can use it to map anything you want in the mouse brain,” Renier says. 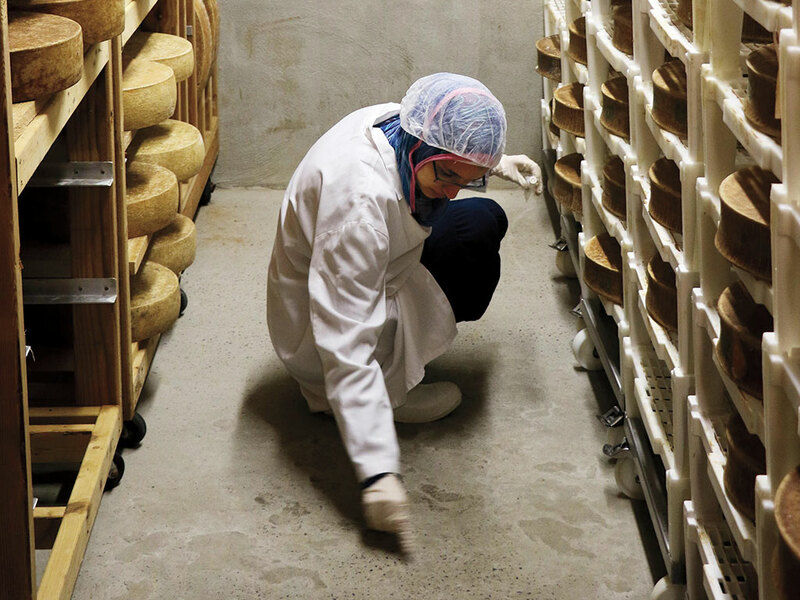 if biologists have a soft spot for microbes, so do cheese makers. On a recent afternoon, high school students from Rockefeller’s Science Outreach lab took their microbiology know-how to a cheese cave—a smelly chamber in which the temperature, humidity, and atmosphere are carefully set to agree with lactose-fermenting bacteria used to ripen young cheese wheels. Hosted by cheese monger Murray’s Cheese, the excursion was part of Learning at the Bench, a semester-long after-school program in which students learn to think like scientists and conduct real experiments. After swabbing different regions of the cave, the students brought their samples back to Rockefeller to isolate strains and extract and genotype bacterial DNA—essential steps in deconstructing a microbial environment. 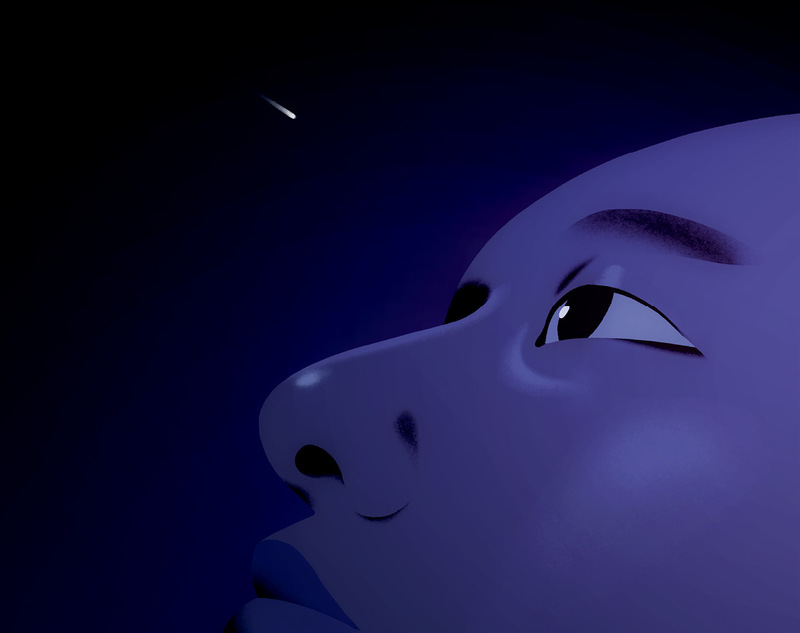 For more on Rockefeller’s Science Outreach program, look for @rockeduteam on Facebook or Messenger. when the 2011 tornado “super outbreak” hit the central plains, it spawned 363 tornados that together caused more than 350 deaths and $11 billion in damage. It was the biggest tornado outbreak ever recorded—and it may be part of a larger trend. 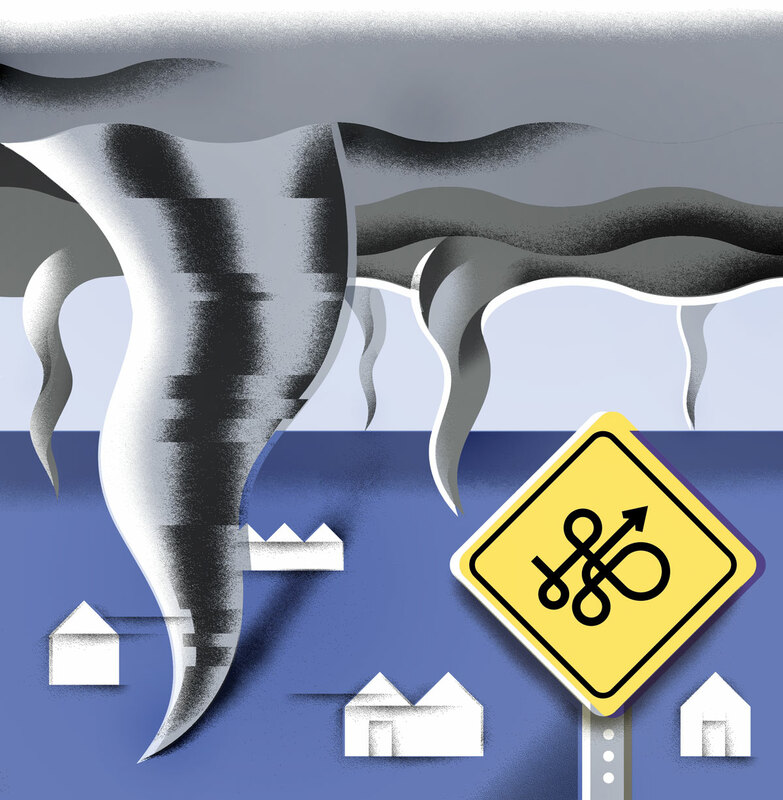 According to Rockefeller’s Joel E. Cohen and Columbia University’s Michael Tippett, the average number of tornados per outbreak has increased by more than 40 percent since the mid-1950s, though the number of tornados per year has not changed. The two researchers have used mathematical tools to examine six decades worth of storm data collected by the National Oceanic and Atmospheric Administration. 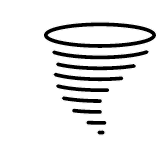 It’s not known why serial tornados are getting increasingly common. The researchers reported in Science in December that they could not establish a direct relationship between the mounting outbreaks and a warming planet. This could mean that climate change has nothing to do with the increased clustering of tornados, or that scientists don’t understand the link. Although the U.S. has more tornados each year than any other country, the U.K. has the most per square mile. 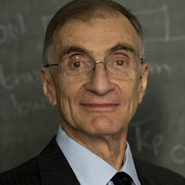 Joel E. Cohen, Ph.D., Dr.P.H. although they may not know it, Rockefeller’s Mary Jeanne Kreek has been a hero to millions of heroin users. Her 1966 discovery showed that a compound developed as a painkiller could help opioid addicts transition to normal lives. It also launched a new framework for understanding addiction as a disease rather than a moral weakness. Fifty years later, some things have changed, and some haven’t. 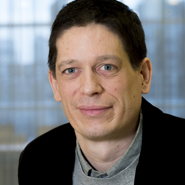 Kreek’s original work on methadone—conducted with clinician Vincent Dole and psychiatrist Marie Nyswander—has given way to sophisticated studies that seek to understand the biological underpinnings of addictions to substances such as cocaine, alcohol, and cannabinoids. Yet attitudes toward addicts, and political resistance to the use of methadone, remain stuck in the past. In the United States, abstinence-based therapies continue to dominate, partly for ideological reasons. 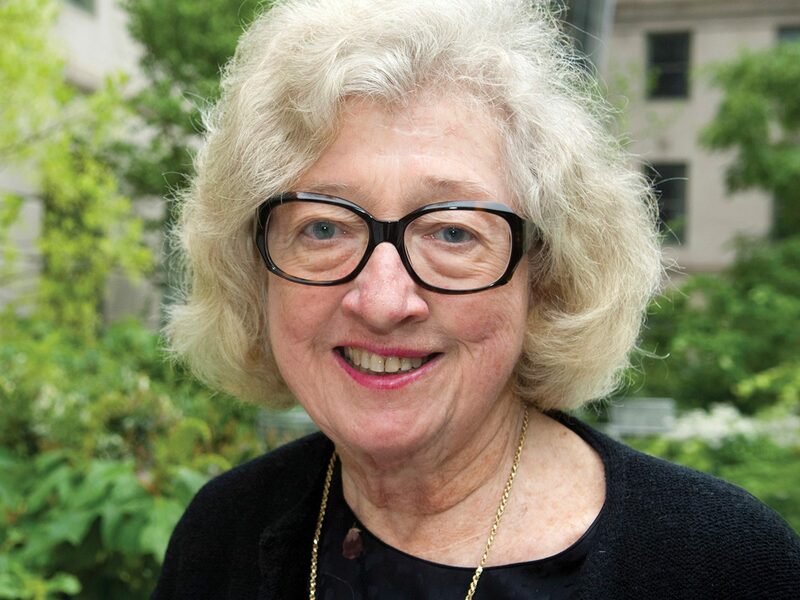 Kreek, who is Patrick E. and Beatrice M. Haggerty Professor, has devoted effort throughout her career to championing the implementation of drug treatment programs at home and abroad. it’s the unwelcome visitor who never, ever leaves. Once inside the body, herpes simplex 1—the cause of painful and unsightly cold sores—can make its way into nerve cells, hide away within them, and possibly stick around for a lifetime. Until recently, no one knew how the virus manages to lie low for so long. 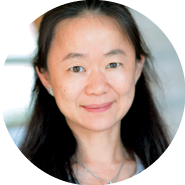 But with pictures captured at the level of individual atoms, a team led by Jue Chen, William E. Ford Professor, has figured out the virus’s secret: a sophisticated sabotage of the body’s inherent defenses. 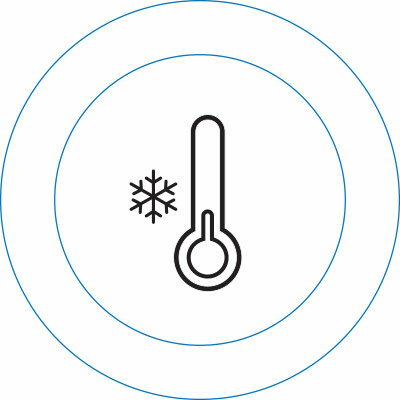 Samples prepared for cryo-election microscopy are chilled to -321 degrees Fahrenheit, eliminating the need for them to be chemically fixed or stained. 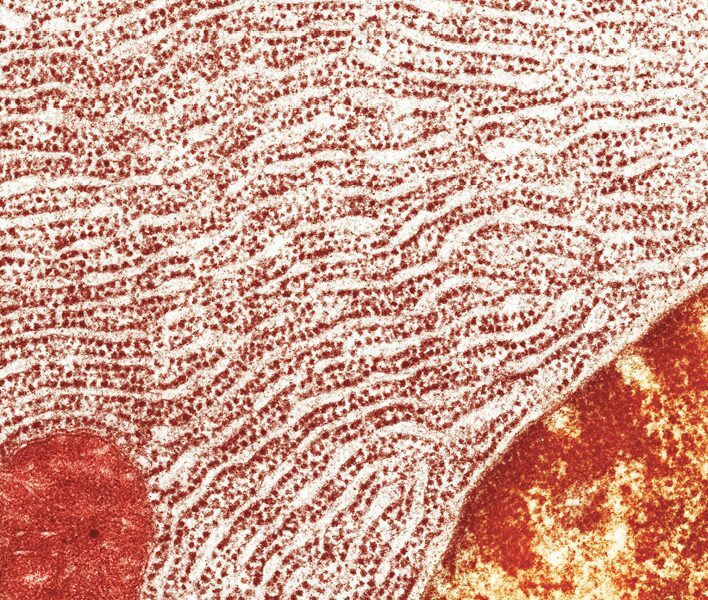 The immune system normally recognizes and destroys virus-infected cells based on molecular bar codes—tiny pieces of the virus displayed on the cells’ surfaces. Using cryo-electron microscopy, the researchers created molecular images revealing just how herpes interferes with this coding system. The virus, it turns out, clogs a transporter protein responsible for pumping these viral pieces into packaging stations inside cells, from where they are shuttled to the cell’s surface. By blocking this transporter, called TAP, the virus effectively hides its own bar code from the immune system. a brain ravaged by Alzheimer’s disease is like no other: it contains deposits of a gunky protein called amyloid-beta, shown as bright speckles in this image of a mouse brain. To get the shot, researchers from Paul Greengard and Marc Tessier-Lavigne’s laboratories used a technique called iDISCO, which involves making the brain tissue transparent so that deep-seated molecules can fluoresce within it.